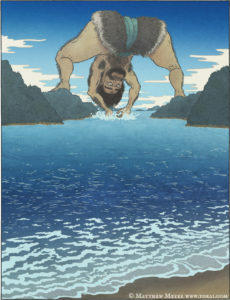 APPEARANCE: A tearai oni is a colossal giant, large enough to straddle mountains. Its leg span is three ri wide–almost twelve kilometers. BEHAVIOR: The most well known tearai oni sighting took place in Sanuki Province (present-day Kagawa Prefecture) during the Edo Period. It was seen straddling the mountains between Takamatsu and Marugame Cities and washing its hands in the bay below. 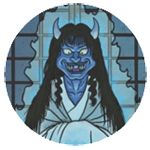 ORIGIN: Tearai oni appears in the Edo Period book Ehon hyakumonogatari, which says that its actual name was unknown to anybody, so witnesses just referred to it as the hand washing demon of Sanuki. Despite its name, it is not actually an oni but is rather a type of daidarabotchi. In this case the word oni is just used as a catch-all term for monsters. Though the term tearai oni doesn’t turn up outside of Ehon hyakumonogatari, other local legends from Kagawa speak of a giant who used to come down from the mountains, straddle the mountains, and scoop up water from the bay with his hands to drink. Giant footprints have also been found high up in the mountains. Its local nickname was kyojin no ojomo, and it has been speculated that it was the same giant as the tearai oni.